If you have a little one who has a favorite book, you know what it’s like to read the same book over and over and over again! When my preschoolers are loving a new book, we could read it 2-3 times in a morning. Recently, we have been reading Eric Carle’s, The Very Hungry Caterpillar, and we are all slightly obsessed. Between the repetitive text, counting the fruit as we read, and the brilliant illustrations, my preschoolers cannot get enough of this book. While planning activities in my classroom, I have been working our favorite hungry caterpillar into all learning areas. 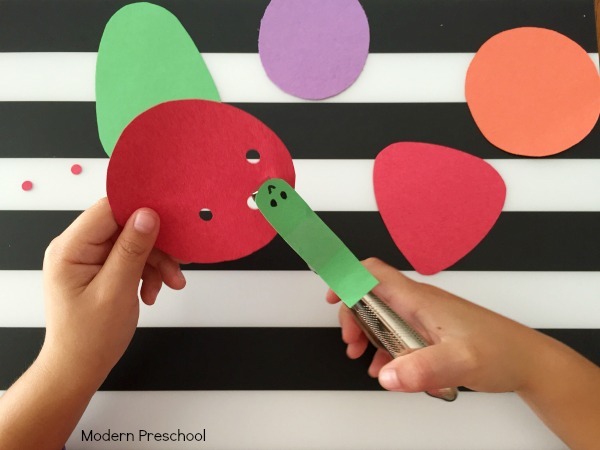 To help strengthen fine motor skills, my preschoolers have been helping the caterpillar munch through fruit with a hole punch (one of their favorite fine motor tools!). 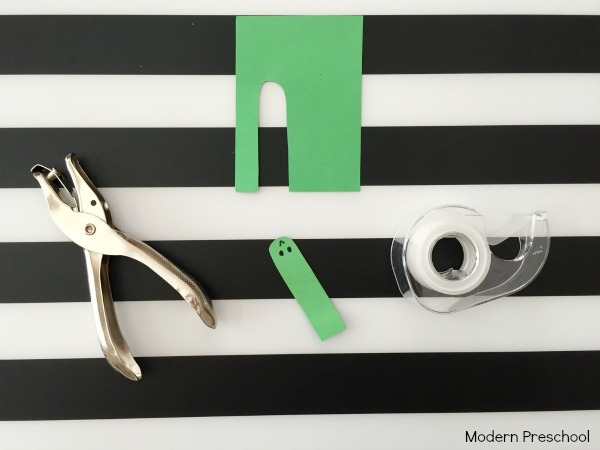 Setting up this fine motor activity is super simple and you probably have all the supplies on hand! While reading The Very Hungry Caterpillar to my preschool class, I couldn’t stop thinking about the holes in each pages. 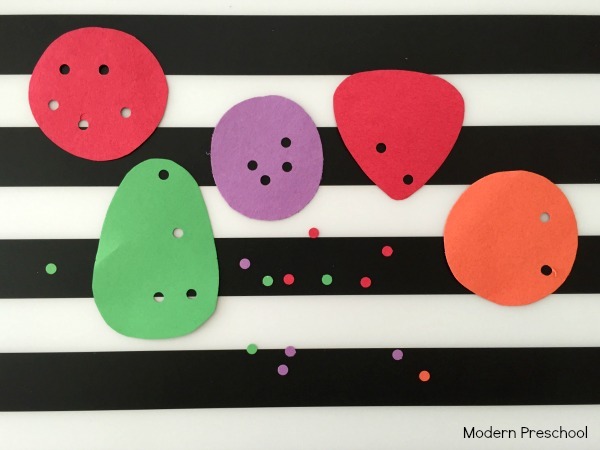 I knew I wanted to incorporate these bite holes into an activity, but was not sure exactly how. Make a necklace? Lace fruit shapes? Then it dawned on me! My preschoolers LOVE using the hole punch. 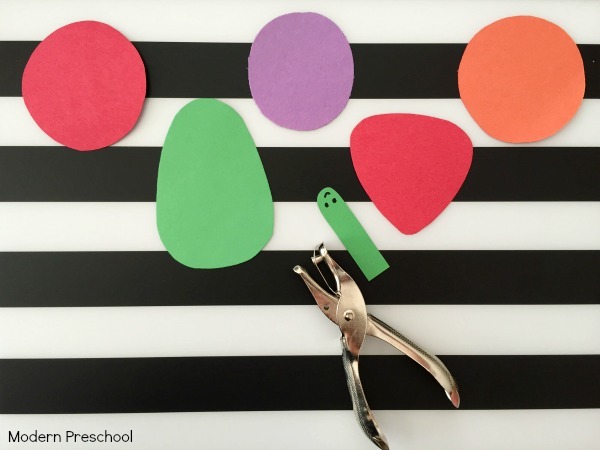 Chomping and munching the hole punch through the fruit shapes was the perfect activity to not only help retell the story (and check comprehension), but also add a fine motor skill. I used green construction paper to make a small caterpillar shape. I added a very simple face on the caterpillar. After cutting the caterpillar shape from the paper, I used clear scotch tape to attach the caterpillar to the top side of the hole punch. I decided to cut the shapes of the fruit from the first part of the story. So each fruit that the caterpillar ate Monday through Friday (when he was STILL hungry), was cut out of construction paper. There were paper apples, pears, plums, strawberries, and oranges. I was not worried about the amounts of fruit that my preschoolers were hole punching. This wasn’t a counting activity. Our focus was on gripping the hole punch correctly, and being able to squeeze it to make holes in the fruit. I set piles of each fruit on the table and my preschoolers chose the fruit they wanted their caterpillar hole punches to eat. Some preschoolers chose one of each fruit. Some chose just a few. Some chose the same fruit over and over again. The little caterpillar hole punches chomped and munched through a lot of fruit, until they were completely stuffed! We knew when their little fingers were getting tired because their hole punching was slowing down, and sometimes not even breaking through the paper any longer. At this point, they would take a break and a new friend would come over to take a turn! 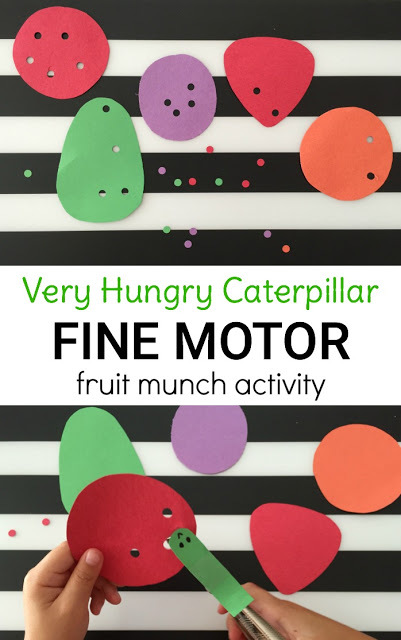 This fine motor caterpillar activity can easily be adapted to fit the needs of older or younger children too! My preschoolers have had a lot of practice this year with using the hole punch, so I knew this could be mostly an independent activity. I just had to make a few adjustments to help place the paper correctly at times. 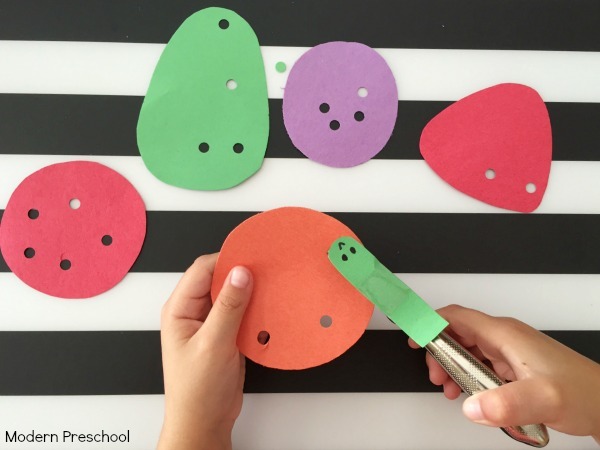 For younger kids, hold the paper for them as they use 2 hands to squeeze the hole punch together. For older kids, write the number of bites to make with the hole punch. So if you wrote a 5 on a pear, there should be five holes on it. You could even make addition problems on the fruit pieces for more advanced learners too! If you have never read (or don’t own) The Very Hungry Caterpillar, you NEED to grab your own copy! We love it that much! Check out our caterpillar sticky wall to go along with a caterpillar or bug theme! Oh I remember the many many many nights (and days! ), I spent reading the VEry Hungry Caterpillar! It’s amazing how kids all over the world love this book, right? The link to the caterpillar sticky wall shows an error. Could you take a look? I’m super interested in this activity! Thanks! !